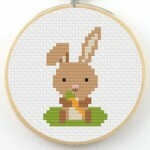 Learn the basics of cross stitch while making this cute and simple bunny design. All materials will be supplied. Space is limited to 10 participants. Free and open to all. Please register. Registration for this program is now full. Please contact the reference department to enter your name on the wait list.